Nothing symbolizes diversity and inclusion more than transit. Public transportation serves everyone regardless of race, religion, ethnicity or income. McCall’s comments came when she addressed about 75 people at the first diversity conference sponsored by the Kansas City Area Transportation Authority on Thursday, April 14. McCall, a member of the Board of Trustees for the Greater Cleveland Regional Transit Authority, was one of the featured speakers at the event held at the Kauffman Foundation Conference Center. She took on controversial state laws limiting the rights of the gay, lesbian and transgendered community, such as the one now under heavy fire in North Carolina. She pointed out that businesses are fighting back against those kinds of laws in the name of diversity – and because it’s good business. America, she said, is no longer made up of separate sub groups of people with their own identity. It’s about all Americans living and working together as one. McCall praised the KCATA for holding the diversity conference, which featured several panel discussions and presentations about the issue of diversity, inclusion and multi-culturalism during the daylong event. She said it was “phenomenal” the authority was holding a diversity conference, saying she knew of no other similar type of event held by a transit agency. And she reminded Authority employees that they’re in the diversity industry every day. 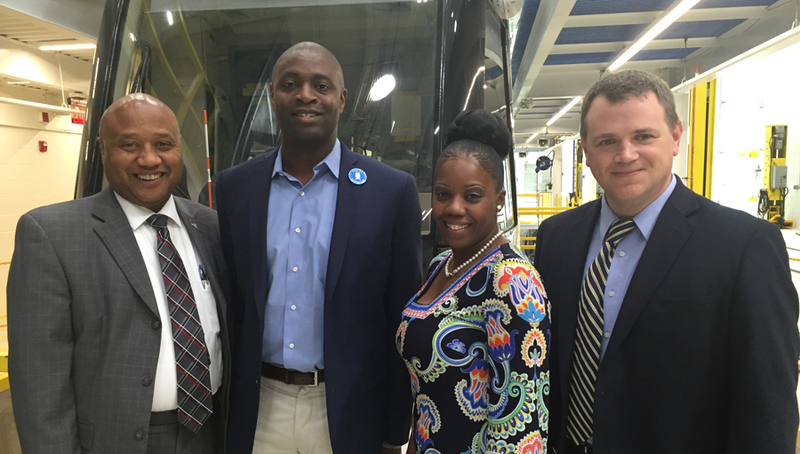 As part of McCall's visit to Kansas City, she toured the Streetcar facility and learned about RideKC: Bridj. Pictured are KCATA COO Sam Desue, Darnell Grisby, Diversity Council staff adviser for the American Public Transportation Association, McCall, and Tom Gerend, Executive Director at Kansas City Streetcar Authority. The KCATA conference also included more than a half dozen guests who were experts in the area of diversity and inclusion. The other guests participating in the conference were: Jason Greer, founder and president of Greer Consulting; Jami Henri, president and chief operating officer of Bellwether; Michael Gonzalez, director and leader for corporate diversity and inclusion at Hallmark Cards; Darnell Grisby, Diversity Council staff adviser for the American Public Transportation Association; Michael Lintecum, executive director of the Mid-America Gay and Lesbian Chamber of Commerce and producer for the Lintecum group; Daniel Silva, executive director of the Kansas City, Kansas Chamber of Commerce; Christal Watson, president and chief executive officer of the Heartland Black Chamber of Commerce; and Michelle Word, principal and supplier diversity manager for Burns & McDonnell. The KCATA is grateful for the participation and thoughtful input provided by each of our invited guests.